According to targeted groups violence prevention can be differentiated in universal, selective and indicated prevention. Universal prevention is targeting the whole population, a group with no indications of violence. 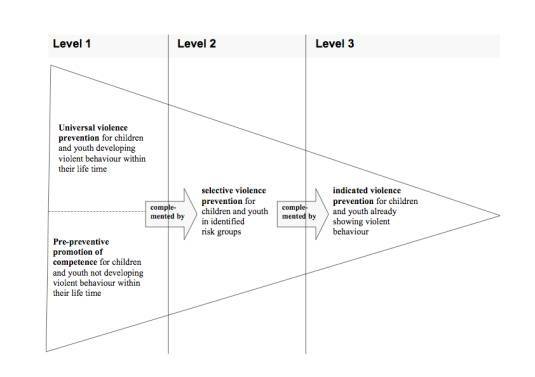 While selective prevention measures are meant for risk groups with probability to development of violent behaviour, indicated measures are targeting groups where violence already occurred. The aforementioned measures are complementing each other. Prevention aiming at reducing risk factors and supporting risk-reducing factors, taking into account the different development stages and developmental tasks of children, are defined as “development-oriented prevention” ( Brezinka 2003, Petermann 2003, Heinrichs et al. 2002). In literature differences in demarcation of the concept can be found. Deutsches Jugendinstitut (German Youth Institute) for example defines violence prevention as measures to reduce or avoid violence. Activities with preventive impact at best are not regarded as such ( Arbeitsstelle Kinder- und Jugendkriminalitätsprävention 2007, p 18) . Based on this understanding, the aforementioned universal or primary violence prevention would not be defined as violence prevention. Art 19 a of the Convention on the Rights of the Child commits all Member States to „ take all appropriate legislative, administrative, social and educational measures to protect the child from all forms of physical or mental violence, injury or abuse, neglect or negligent treatment, maltreatment or exploitation, including sexual abuse, while in the care of parent(s), legal guardian(s) or any other person who has the care of the child ”. Wording lays ground not only for a broad definition of violence prevention including non-violent education and universal violence prevention but also for the obligation of Member States to create frameworks assuring full implementation of the right to violence prevention. Following this rationality and contents of Art 29 states should take all appropriate measures to enable parents and professional care givers, educators, teachers to non-violent education and upbringing and assure implementation of the culture of peace and non-violence. Results from UN study on violence against children are endorsing above explanations. Taking into account, that Early Childhood Care and Education (ECCE) is covering „years of extreme vulnerability and tremendous potential, during which adequate protection, care and stimulation are essential to provide the foundations for the child’s well-being and development” (UNESCO, Strong Foundations, Early childhood care and education, 2007, see also www.efareport.unesco.org) implementation should be of high priority for implementation in compulsory kindergarten education.